This Carlisle basting brush features soft nylon bristles that are hefty enough to hold your sauces, glazes, and butters without damaging your most delicate pastry items or your heaviest meats. 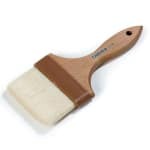 Perfect for bakers and cooks of any skill level, this basting brush is ideal for buttering biscuits, glazing breads and basting turkeys. The 4 inch length makes this basting brush compact enough to be stored anywhere and is comfortable to use.